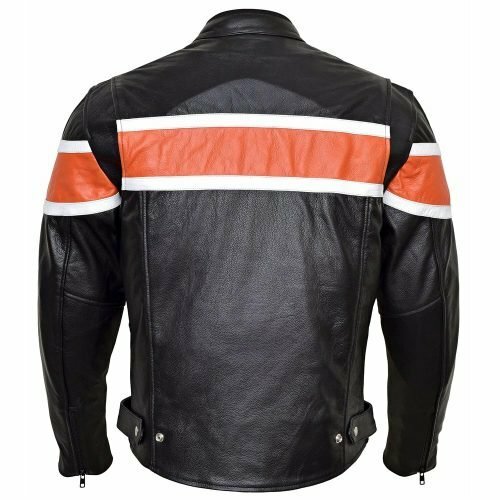 Classic design with white and orange stripes make this a highly recognizable leather jacket. Full Grain Cow Leather at 1.2mm thickness will provide maximum protection and abrasion resistance. 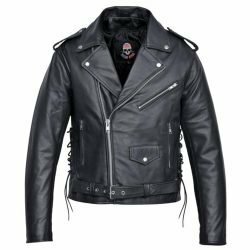 We provide Lifetime Leather Warranty on this Jacket. 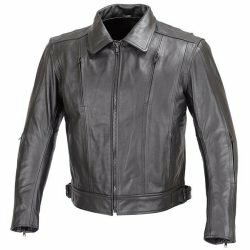 This Leather Motorcycle Jacket is constructed from 1.2mm thick Full Grain Cowhide. 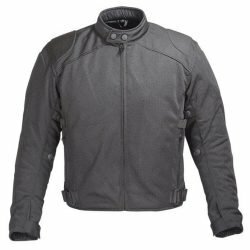 The quality leather construction provides optimum protection, durability and comfort. 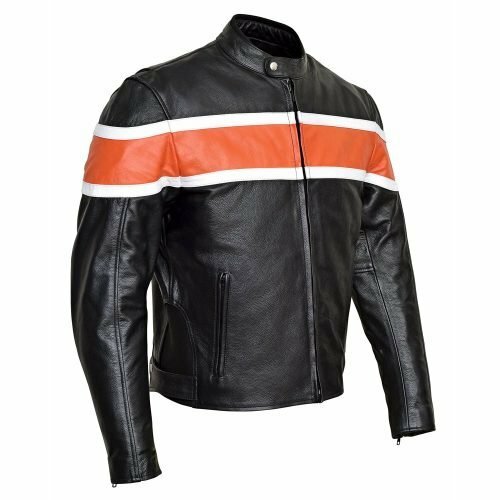 Orange and White stripes encircling the chest, back, and upper sleeves provide a classic look. 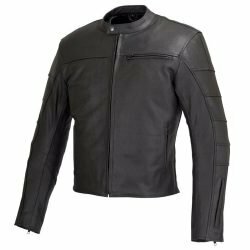 This Leather Motorcycle Jacket comes pre-installed with five pieces of CE rated body armor. Two pieces for elbows and shoulders each and a back protector. All the armor is removable and is EN1621-level-1 compliant. Neoprene padded soft collar avoids chaffing and discomfort. 1.75” wide storm flap backing the front zipper closure. Two side waist straps with dual point adjustability help fine tune the fit around waist. Two front hand warmer pockets with zipper closures. Four inside pockets in total. Two napoleon pockets and two pockets in the liner provide ample storage space. There is an eight-inch pant integration zipper on inside. 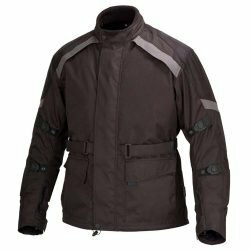 Action back and gusseted shoulders provide freedom of action and reduce rider fatigue. 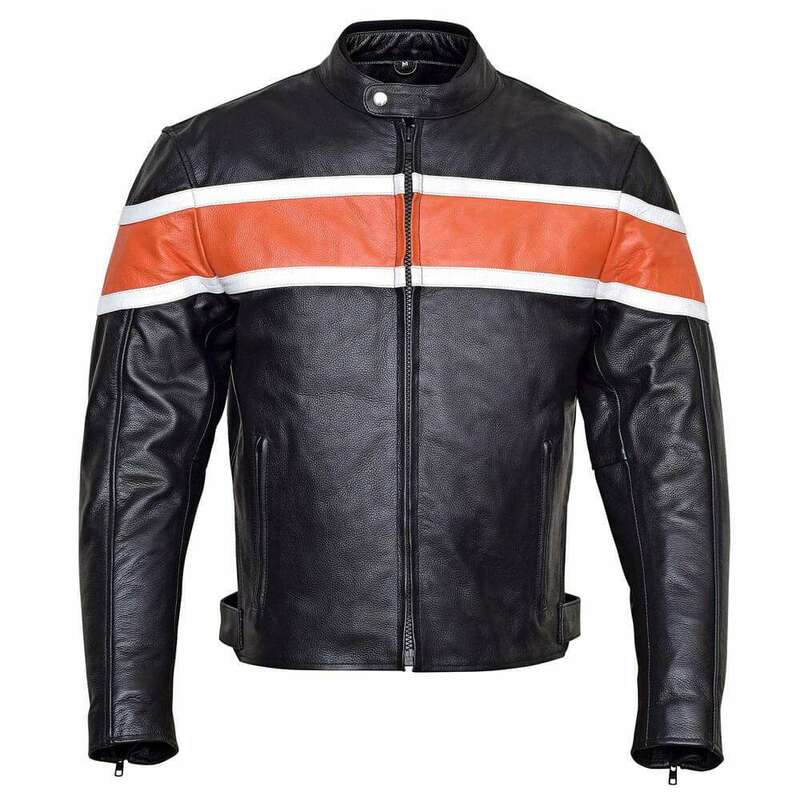 Arms are pre-curved for a perfect look, fit and for maximum comfort while in riding position. Zippered and gusseted cuffs for fitment and comfort. 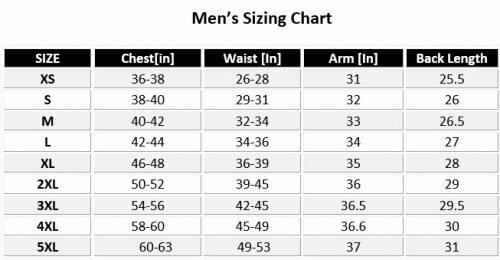 Polyester stretch panels on side waist ensure fitment and comfort. 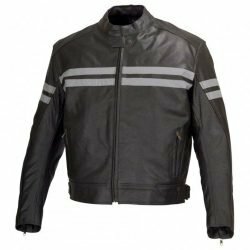 We provide Limited Lifetime Leather warranty on this Leather Motorcycle Jacket. Our Lifetime Guarantee is a warranty against defects in Leather and workmanship. Our leather, as with all-natural materials, will occasionally have unique characteristics such as small scars, creases and variations in the color and are not considered defects.